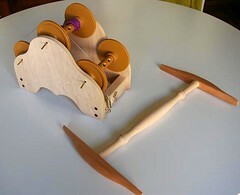 I’ve finally purchased a tensioned lazy-kate and a larger niddy-noddy for myself. The lazy-kate was ordered for me by Debbie from Iron Horse Farm and I bought the niddy-noddy from Mind’s Eye Yarns at their booth at the Gore Place sheepshearing festival in Waltham, MA back in April. I finally cut up my pattern pieces for the Frenchy Bag. This was back on Sunday and I haven’t had a chance to do more. I really wanted to have finished this week but I don’t know that it’s going to happen. 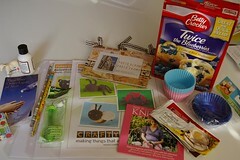 I received yesterday my Special Swap Sweet Treats swap package from Yarn Yenta. She sent me an assortment of fun goodies including a muffin mix, cute patterns for felted toy animals, a chibi and a tape measure. I’d been wanting a chibi for a while now and now I have my own! On the left you will notice my Noro Kureyon Sock. It’s knitting up fairly well. The yarn is rough and has uneven spots here and there but I’m not disliking the process at all. There was a break in the stripe continuation mid-heel and at first I just knit it like that. Then, after having started the leg I just ripped it all out and decided to keep the striping sequence and split-splice the yarn together. This is the sock that I will be bringing on my trip to TNNA tomorrow. Donna and I are driving out to Columbus, OH for the show. We’ll both be driving so there will be time for some knitting. I’m really excited about going to the show, I think that it will be crazy but super interesting. We’ll be stopping here and there at some yarn shops so if you know of any in the area, make sure to let me know! I’ll be back Tuesday with details about the trip! 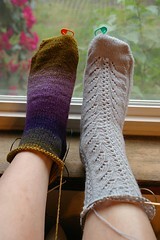 The sock on the right is a Rococo sock by Knitspot knit in O-Wool Classic 2-ply. I only have 8 rows left to knit and then I can bind off. The pattern is very fun and interesting without being difficult. I love how the sock looks and I’m looking forward to having a pair. So this is what’s going on at Knitting In Pink’s. I hope that once all these trips are over that I’ll have a bit more time for crafting and blogging and will be able to post more often. I have that lazy-kate and that same niddy-noddy there great! 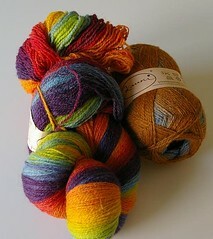 Love the colors in your yarn, lucky you to get them. And that sweater WOW! Oh, that Kauni is amazing!! Ah, yes, the random Noro knot with color break… Have fun at TNNA! There are some really great stores in Columbus (I live an hour away from there). I would recommend the Knitter’s Mercantile. They sponsor Knitters Connection which happens next weekend at the Convention Center, too. Oooh, pretty socks! I’m making a sweater out of the same Noro colorway. I can’t wait to hear about TNNA. Hope you had fun!